- Rising safe haven demand from 'Trumpflation' and geopolitical tensions and falling mine supply should lead to "much higher gold prices"
- What happens when the unstoppable force of robust global demand for gold meets the immovable object of a small, finite, rare and dwinding supply of physical gold? We have written about ‘peak gold’ and the ramifications of the underappreciated peak gold phenomenon for the gold market since 2008. The risk of falling gold production and a consequent reduction in supply are slowly percolating into the mainstream and analysts are asking whether 2015 or 2016 marked the year of peak gold production. Byron King has written about this increasingly important supply factor in the gold market and brings together the views and research of Glencore CEO, Ivan Glasenberg, Thomson Reuters GFMS and others. The collapse in South African gold production (see chart above) is the 'classic canary in the coal mine' and likely foreshadows the coming decline in global gold production. 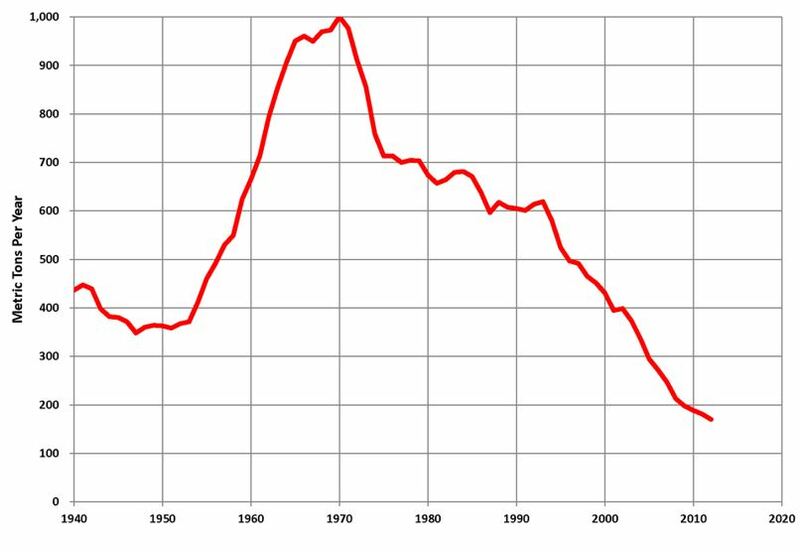 South Africa produced over 1,000 tonnes of gold in 1970 but production has fallen to below 250 tonnes in recent years (see chart above). This is a collapse as these are levels last seen in 1922 and happened despite the massive technological advances of recent years and more intensive mining practices. Regarding global gold production, the world’s largest gold producer and now the world’s largest gold buyer China, has been the only major producer to see an increase in gold production in the last few years. There has been a huge increase in Chinese gold mining supply in recent years. We wonder about the accuracy of some of this data and whether the figures are being exaggerated by gold mining companies in China and by bureaucrats. Gold mining companies sometimes exaggerate the scale of their assets in the ground and sometimes of their production as was seen in Bre-X, recently popularized in the movie 'Gold'. 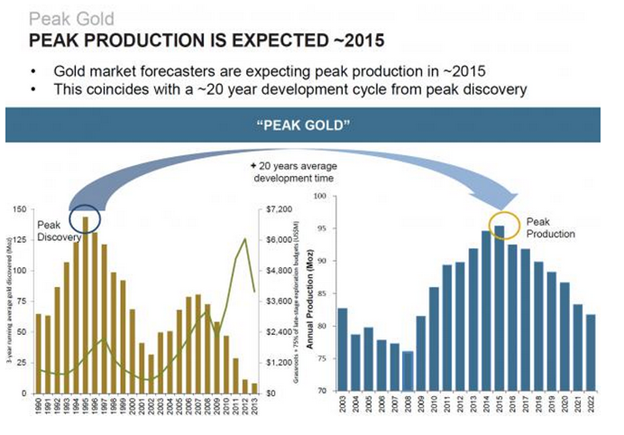 There is concern that gold production in China may actually be declining as older mines see reduced production. Frik dissects a recent report by Thomson Reuters about how primary global gold output declined in 2016. Specifically, Mining.com sums up the report: “World gold mine supply fell by 22 tonnes, or 3%, year on year according to the GFMS Gold Survey, to 827 tonnes in the third quarter of 2016. We live on a small, finite planet which is confronted by massive population growth, a near infinite growth in global currency supply and in financial instruments such as derivatives. We are consuming all our natural resources in a completely unsustainable manner. What happens when the unstoppable force of robust global demand for gold meets the immovable object of a small, finite, rare and dwinding supply of physical gold? - Most Overvalued Stock Market On Record — Worse Than 1929?